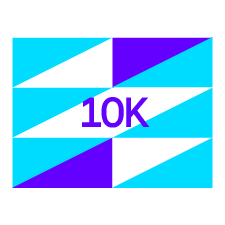 Finish a 10k for a unique finisher’s badge. Race a 10k whenever and wherever you like in March to complete this Challenge. Skip the registration fees and pre-dawn wake up. Don't skip the chance to push yourself and set a new 10k PR. Just pick a safe stretch of road (or trail), choose a route that is at least 10 kilometers long, and let it rip. Athletes who complete this Challenge will receive a Strava Races 10k digital finishers badge in their Trophy Case. You have to run 10 kilometers in a single run, just like you do in a race. Your position on the Leaderboard is based on the fastest average pace of any activities that meets (or exceeds) the Challenge goal requirement. The average pace is taken based on elapsed time and includes the entire duration of the qualifying activity (not just the fastest 10 kilometer section of your activity). You will not show up on the Challenge Leaderboard unless you complete an activity over 10 kilometers. To ensure you meet the Challenge goal, we recommend you run a small amount over 10 kilometers during your activity (about .5km / .3mi). This will give you a buffer in the event your activity distance is shortened after upload to Strava due to the cleanup of GPS irregularities. You can learn about how distance is calculated for our app by reading this Knowledge Base Article. There is no time limit to complete the 10 kilometers. The Challenge period starts and ends based on each runners local time zone. Manual entries or treadmill runs will not count towards your Challenge effort. Have fun and be safe. Use common sense when it comes to traffic, weather, or other conditions while taking part in this Challenge. Q: When do I have to complete the 10k? A: You can run the 10 kilometers necessary to complete the Challenge in a single run any day of the month. Q: Can I run multiple times to add up to 10 kilometers? A: No, you have to run 10 kilometers in a single run. Q: Is there a time limit for the 10k? A: No, there is no time limit to complete the 10k. Q: Can I crop my run if the activity is longer than 10k? A: Yes, if your activity happens to be longer than the 10 kilometers necessary to complete the Challenge you can crop your activity to remove the sections that you do not want to count towards the Challenge.